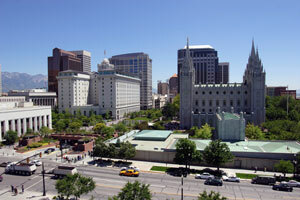 Salt Lake City, also known is “The Crossroads of the West,” is the capital of Utah and is home to over 180,000. There are several neighborhoods throughout SLC which allow for specialized local advertising and billboards. Notable neighborhoods with effective advertising opportunities are Sugar House, The Avenues, and Federal Heights. Tourist attractions like the Hogle Zoo and the Family History Library, the world’s largest genealogical library, present another out-of-home advertising opportunity. Well-placed billboards or other outdoor media around these tourist hotspots is a great advertising strategy. Major highways like I-15, SR-201 and I-80 offer billboard possibilities that could yield high traffic exposure. Zip Codes: 84101, 84102, 84103, 84104, 84105, 84106, 84107, 84108, 84109, 84110, 84111, 84112, 84113, 84114, 84115, 84116, 84117, 84118, 84119, 84120, 84121, 84122, 84123, 84124, 84125, 84126, 84127, 84128, 84130, 84131, 84132, 84133, 84134, 84135, 84136, 84137, 84138, 84139, 84140, 84141, 84142, 84143, 84144, 84145, 84147, 84148, 84150, 84151, 84152, 84153, 84157, 84158, 84165, 84170, 84171, 84180, 84184, 84185, 84189, 84190, 84199.